A few years ago I went to a cheese-making class run by Sicilian Giorgio Linguanti from “That’s Amore” and we made burrata. It was the first time I had heard of this cheese and frankly I am not sure how this creamy delight had escaped me for so many years. For the uninitiated it is a ball of stretched fresh mozzarella with a knot on top, filled with cream and strands of fresh cheese. It originated in the italian region of Puglia and it wobbles around when you push it with your finger, threatening to burst open and allow all the cream inside to ooze out. The flavour of burrata (means buttery in italian) is quite delicate so it is best served at room temperature. I love to serve it in a salad with broad beans, kalamata olives, mint and olive oil when it is broad bean season. It mixes with the dressing and when you eat it, you alternate mouthfuls of olives and mint with mouthfuls of crusty bread that you use to mop up the burrata cream. It is also lovely with warm vegetables so that it melts slightly, becoming even creamier. In this dish, from the cook book Polpo, by Russell Norman, Puy lentils are added to a soffritto of carrots, onion and celery, which is dressed with a mustard Gorgonzola dressing and drizzled with basil oil. The burrata is (quite dramatically) torn open, oozing and then melting slightly over the still warm vegetables. Just delicious! This dish (which serve four) makes a lovely rustic lunch or a hearty entree for a dinner with family or friends. I like to serve it with a glass of Soave from the Veneto region. A reminder for all readers living in Victoria (Australia): on Sunday 19 October I am running a cooking class at Prospect Cottage in Chewton. We will be making a 4-course italian seasonal lunch to share. I would love you to join me – fingers crossed that it will be a beautiful spring day. There are still two places available – details are here. Make the basil oil by placing the washed leaves (reserve a few for the garnish) into a food processor with some oil and salt and pepper to taste. Process for a few seconds until you have a thin oil and set aside. Put the Puy lentils in cold water in a medium saucepan so that they are covered by about 7cm (3 inches) water. Bring to the boil and cook for about 30-35 minutes or until they are just soft but still hold their shape. Drain and set aside. In a large frypan, heat up a couple of tablespoons of olive oil on medium heat and add the carrot, celery, onion and thyme. Cook on low-medium heat for around ten minutes, so that the vegetables are softened but not coloured, add the garlic and cook for a few more minutes. Add the drained lentils and heat through, adding a bit of water if necessary to stop them sticking. Add salt and pepper to taste. Keep on low heat whilst making the dressing. To make the dressing, place the olive oil, red wine vinegar, mustard, pinch of salt, some pepper and the sugar into a small bowl and whisk. Stir through the Gorgonzola. Add the dressing to the cooked vegetables and place on a serving plate. Tear open the burrata onto the vegetables (using individual or shared plates). Drizzle on some basil oil and garnish with reserved basil leaves. 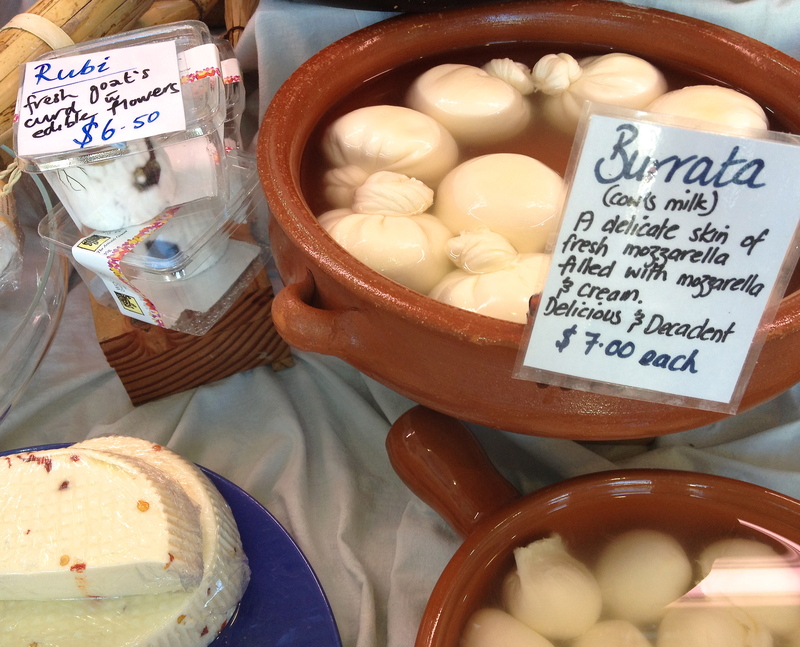 I love burrata, and this sounds like an absolutely wonderful way to enjoy it. And how exciting – a cooking class. I envy your students. I bet it will be a terrific class. Have fun teaching! Thank you I am very excited about the class – lots of planning still to do but it will be fun!! Ciao Paola, I just got back from Abruzzo, where they grow beautiful small lentils in and around the Navelli plain. This is a perfect way to use them. The best burrata I ever had was a few years ago when my family took a trip to Puglia. So delicate and creamy. I’m not familiar with the book Polpo. I’ll have to see if it’s available in the U.S. Lovely recipe and photos. Grazie. This looks lovely! Can I ask if you have a recommendation on a wine to pair?